During the 1940s, Motorettes provided a fun, convenient way to get around the resort town. The U-Drive It Motorette Co. had an outlet at GOTL, located on Golf Street. 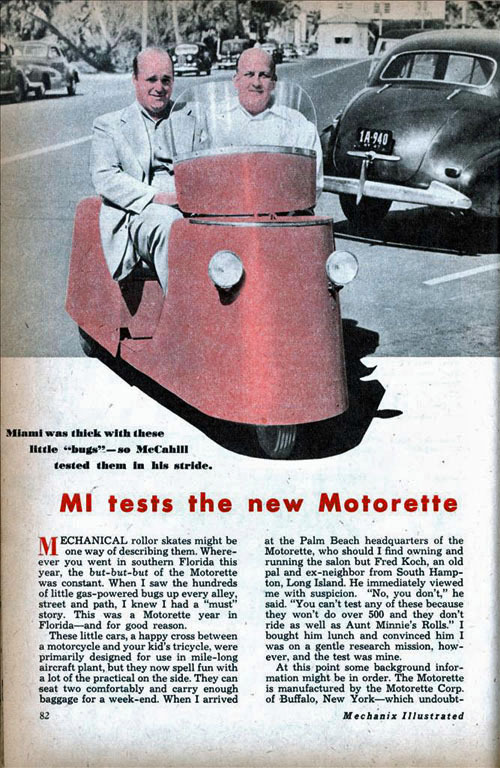 Motorette Corp., of Buffalo, NY, began production in 1947, but the ad for U-Drive It appears in a 1946 Beachcomber, so it is unclear if the Buffalo firm was involved in the Motorettes at GOTL. The three-wheel vehicle had a one-cylinder, air-cooled engine that boasted a top speed of 39 mpg when fully loaded. The little cars resembled a kid’s carnival ride and did not give the driver a sense of safety on the highway. But the mileage was great, up to 110 mph (perhaps measured on an incline).